James Johnson has been one of the go-to shooters all season long for the Bobcats. Even when he missed his first six shots Monday night, his teammates kept giving him the ball. He eventually found his old reliable stroke from the perimeter. 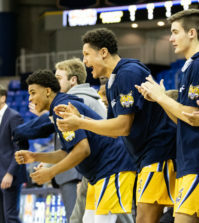 Johnson, known as “Bo,” hit two clutch 3-pointers in the final 1:47 to give Quinnipiac a 55-48 victory over Sacred Heart at the William H. Pitt Center, clinching a spot in the conference tournament for the Bobcats. 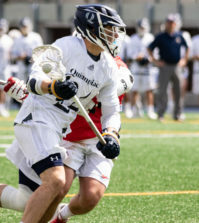 Johnson broke a 48-all tie when he shot a 3-pointer from the left wing, and then gave the Bobcats a two-possession lead when he made another shot from the top of the key as the shot clock expired. Johnson has started every game for QU since his arrival, and he moved past Kason Mims for consecutive starts for a Bobcat, playing in his 89th straight game. 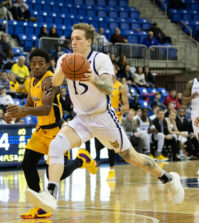 Johnson and the rest of the Bobcats found a way to hold Pioneers’ Shane Gibson, the league’s third-leading scorer, to three points. Justin Rutty scored 13 points and brought down seven rebounds for the Bobcats (17-8, 9-5 NEC), who remain in a third-place tie with Wagner in the conference. Lance Brown added 12 points and led the team with eight rebounds. Louis Montes recorded a double-double for Sacred Heart (9-16, 4-10), tallying 12 points and 14 rebounds. Jerrell Thompson led the Pioneers in scoring with 13 points. 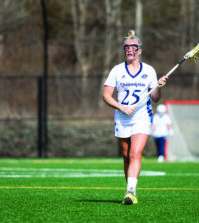 Quinnipiac plays conference-opponent Bryant on the road Thursday night.